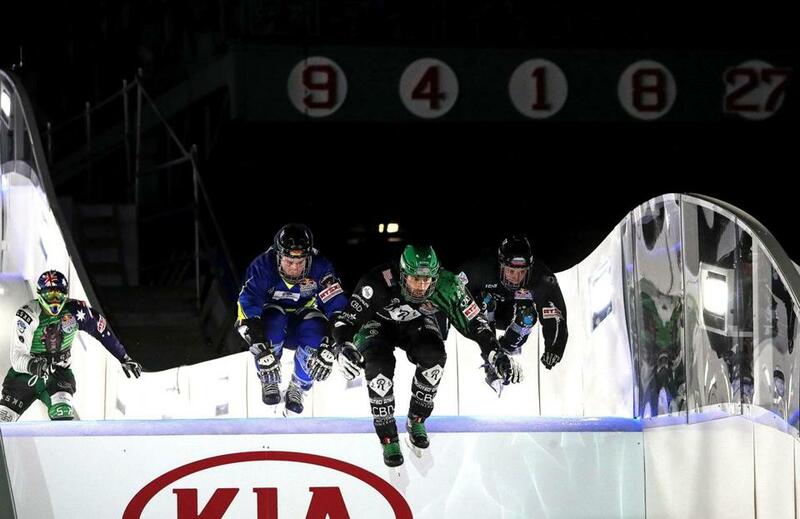 Competitors make the last turn for the finish line at the Red Bull Crashed Ice event at Fenway Park. It’s been a historic week for Katie Guay, though she isn’t thinking about that. She isn’t thinking about how she became the first female referee in a men’s Beanpot game Monday, or then officiating a women’s Beanpot game on Tuesday. Nor is she thinking about winning a monthlong competition to qualify for a spot in this weekend’s Red Bull Crashed Ice event at Fenway Park. No, Guay is actually thinking about how she could’ve skated faster in her time trial Friday inside the historic ballpark. What Guay wasn’t fully acknowledging was that it was her first time skating on an official ice cross downhill course. The 1,200-foot long narrow sheet of ice, built inside Fenway to descend from a seven-story structure in right field, includes jumps and steep downhill shoots. The learning curve — no pun intended — is a steep one. Yet Guay sets a high standard for herself. It’s part of the reason why Guay, a 36-year-old former Brown hockey player, has achieved so much. Not only has she made herself a fixture officiating college hockey, she also worked women’s games at the 2018 Pyeongchang Olympics. “For these two events to happen in one week when a year ago I was gearing up to head to South Korea for the Olympics, it’s certainly very rewarding,” Guay said. To even get to Fenway for Crashed Ice, Guay had to beat dozens of female competitors to win the wild-card spot. Red Bull hosted a series of open qualifiers in Boston and Buffalo, searching for undiscovered talent. Guay jumped at the opportunity. 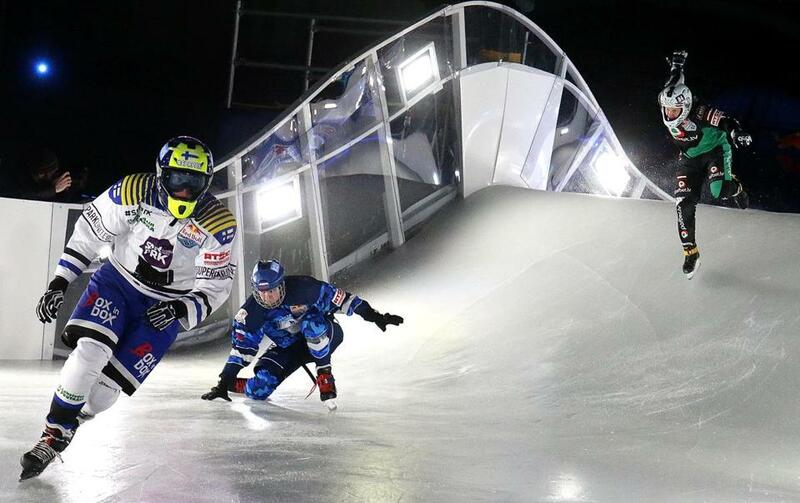 Many memorable moments have happened beneath the retired Red Sox numbers in right field at Fenway Park, but nothing like the Red Bull Crashed Ice event that was held Friday. The final tryout took place at Loon Mountain in New Hampshire in January. For Guay, it forced her to confront a completely new challenge: skating downhill. “It was pretty intimidating being on a mountain with skates on,” Guay admitted. “I’ve skied plenty of times, and it was kind of the same feeling being at the starting gate with my skates on at Loon that I’ve felt in the past when I’m skiing on a black diamond and I look down and say, ‘Whoa, this is way out of my ability.’ That’s kind of how I felt. The 600-foot course offered a taste of what would come at Fenway, but first Guay had to win at Loon to qualify. After setting down the fastest time in her first run, Guay was slower in her second. But as skater after skater completed their runs, her time still remained at the top of the leaderboard. Waiting proved to be the hardest part. When the last racer came and went, she was still first, and headed to Fenway. Of course, extent of the difficulty on an official ice cross downhill course was on another level. 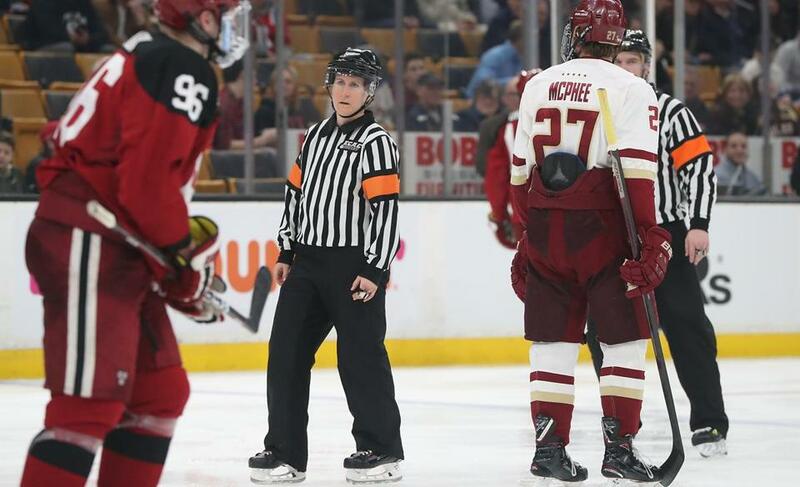 Referee Katie Guay became the first female to referee a men’s Beanpot game Monday at TD Garden. Though she failed to advance past Friday’s time trial stage, Guay said she would give it another chance if the opportunity arose. Whatever her future in ice cross downhill, Guay will keep focusing on her primary goal: pushing for more opportunities for female hockey officials.